Jetty East, a small, gated Gulf front resort community located on the secluded Holiday Isle at 500 Gulf Shore Drive in central Destin Florida, conveniently located just a mile and a half from the bustle of Highway 98 where you can find fantastic restaurants, a plethora of shopping, and attractions for everyone in the family. The property boasts over 900 feet of beach line with emerald green waters that affords you endless adventures – sunning, swimming, parasailing, kayaking, paddle boarding, sand castle building, crabbing or just kickin’ back. Enjoy the short walk to the Jetty bordering the East Pass where you can fish, snorkel, watch the coming and going of the boats, or just sit and contemplate all the beauty that abounds here. Within the property, there’s a 3,500 square foot Pavilion with 12 charcoal grills and plenty of seating, two lighted tennis courts, a shuffleboard, a fabulous Gulf side seasonally heated pool with a hot-tub that overflows into the pool. There are 1, 2, 3, and 4 bedroom units with balconies and patios, free Wi-Fi, fully equipped kitchens with full size appliances, and washer and dryers. 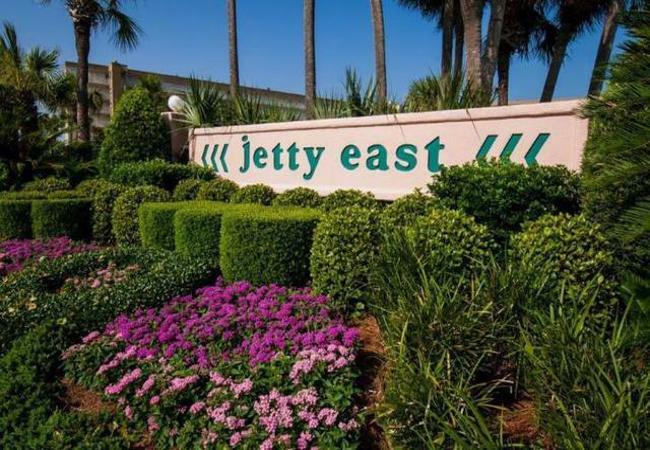 Jetty East is close to both fine and casual dining restaurants, Big Kahuna’s water-park, and all the activities and water-sports at the Destin Harbor. Jetty East is a great place for unforgettable Florida family vacations which has lead to memory making for three generations on the beach, by the pool and hot tub, playing tennis or shuffleboard, and grilling dinner in the huge pavilion on the beach as the sun sets on another Jetty East day. Guests return year after year to be WELCOMED BACK by the dedicated staff they have come to know so well. You will love the beautiful views from all of our fully equipped units. Watch the boats going through the East Pass into the Gulf by the East Jetty that provides some of the best fishing in Destin while enjoying the birds and other wild life on the adjoining nature preserve. Catch a breath taking sunset as another perfect Jetty East day draws to a close. Book your reservation and we’ll see you soon at The Jetty!